This weekend I was scouring for new Barbecue recipes and came across Barefoot Contessa’s Foolproof Ribs. I just had a hankering and thought this would begin our celebration for Father’s Day. A week-long celebration, he deserves it right. Either that or I was too impatient to wait until next weekend to try this recipe! 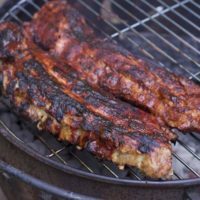 My husband has made ribs on the grill before but I was thrilled to try this recipe as last time his were very dry…. 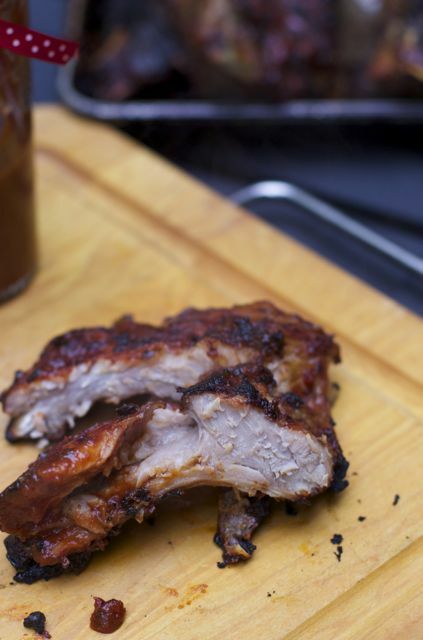 Easy ribs recipe that anyone can do and any time of year since you bake them in the oven first. 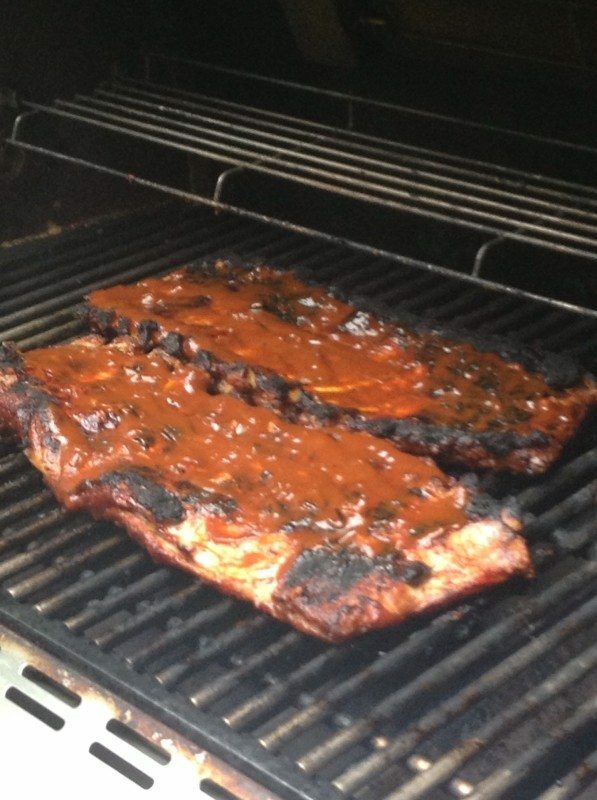 This barbecue recipe starts out with making your own sauce. I did not read the directions first and thought you just baked them and then added the sauce so I was in a bit of a rush to make the sauce. It takes a good 40 minutes to make this sauce. If you want a good no cook sauce and father’s day gift idea check out this post. My husband said let’s just use Rays sauce, I am glad we did not this was well worth the wait. I was a little nervous at the look of the sauce at the beginning, it has a lot of ingredients. 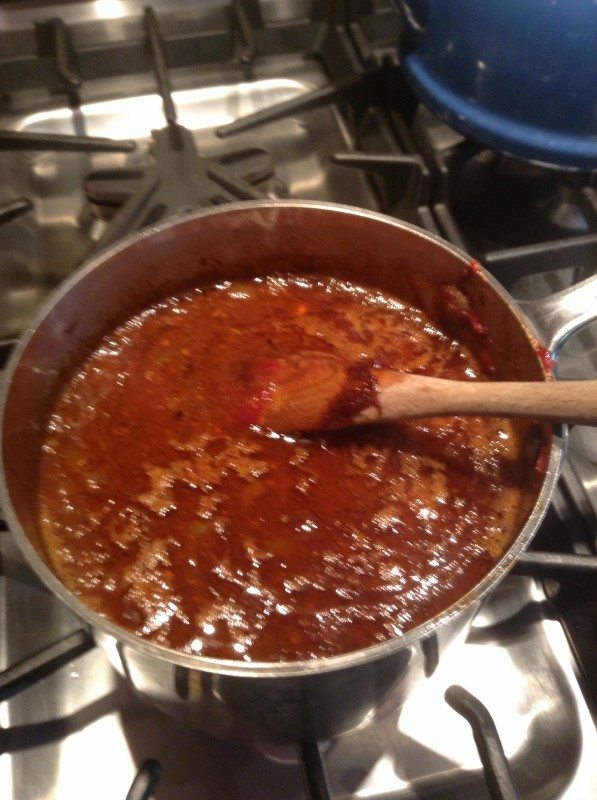 After 30 minutes of simmering, look at this amazing barbecue sauce now. My husband and I were eating it by the spoonful. It had an addicting kick to it that was amazing. You can easily make this a few days ahead of time and just keep it in the fridge. We had some left over after our dinner as well. Now for the prep of the ribs, could not be simpler. Just flavor with salt and pepper and lavish it with sauce. Cover lightly with tin foil and in the oven for 1 1/2 to 2 hours. Depending on your type of ribs. Smother with your BBQ Sauce. Look how dark the sauce got in the oven with all the sugar of the bbq sauce. If you are entertaining you stop here and put the ribs into the fridge. Now on the grill for only 5 minutes per side after being coated with more BBQ sauce. 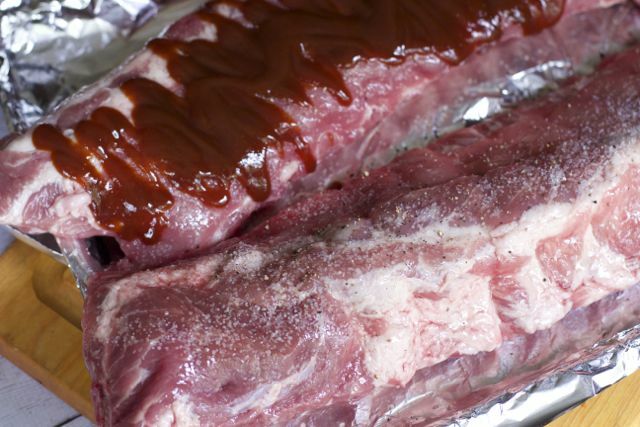 Let the ribs rest for 10 minutes cut and serve. WE definitely needed to serve it with more BBQ sauce but we devoured the entire 2 racks of St. Louis ribs. 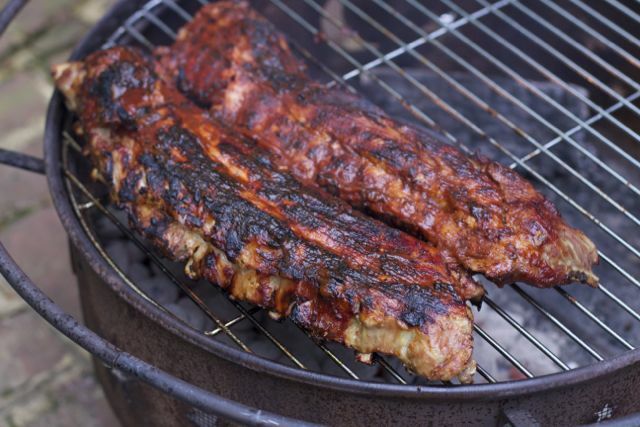 Truly an easy ribs recipe. What are you making for Father’s Day or BBQ recipes? 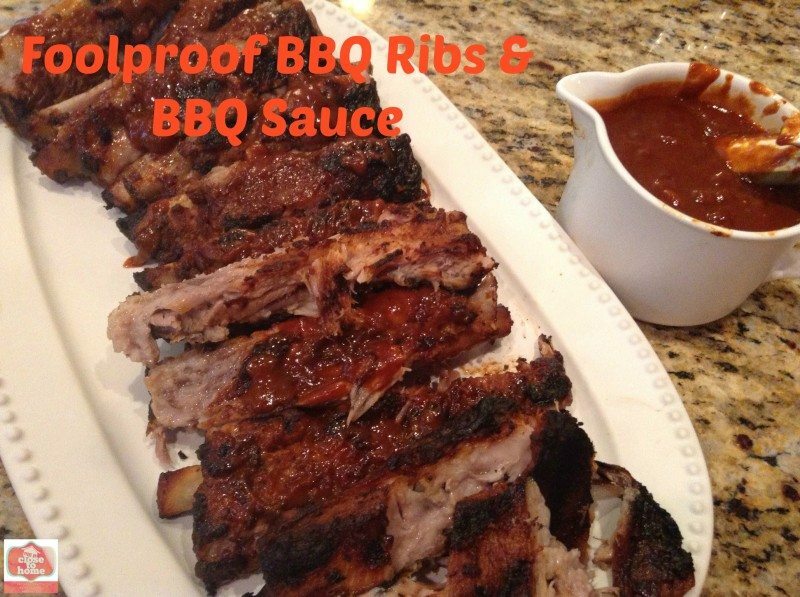 An amazing rib recipe that can be made ahead plus homemade BBQ sauce. In a large saucepan on low heat, saute the onions and garlic with the vegetable oil for 10 to 15 minutes, until the onions are translucent but not browned. Add the tomato paste, vinegar, honey, Worcestershire sauce, mustard, soy sauce, hoisin sauce, chili powder, cumin, and red pepper flakes. Simmer uncovered on low heat for 30 minutes. Grill for 5 minutes per side, watching carefully not to burn Rib side down then meat side down. Your ribs look delicious! I’m visiting from Friday Food Frenzy. 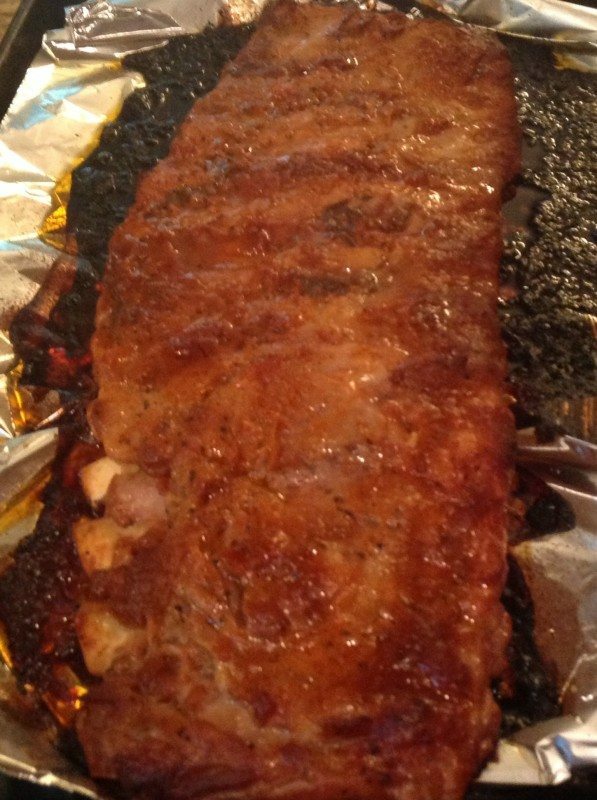 Hi Maria, Wow your ribs look amazing and thanks for the step by step instructions for cooking them. I am definitely going to try making them for my next bbq. Thanks and have a great weekend & week. Thanks for the recipe! My ribs always turn out dry. Can’t wait to try this recipe. Ooh, those look delicious! I love ribs. A lot. More than a lot, in fact. Like, can eat a rack of ribs at a time and, while stuffed towards the end, cannot bring myself to stop eating them kind of love. Thank you for sharing that awesome recipe! Now those are some serious ribs. Makes me really hungry – perfect Father’s Day recipe. Gosh that sounds delicious–no bar-b-queuing here–don’t have a place to do it! !